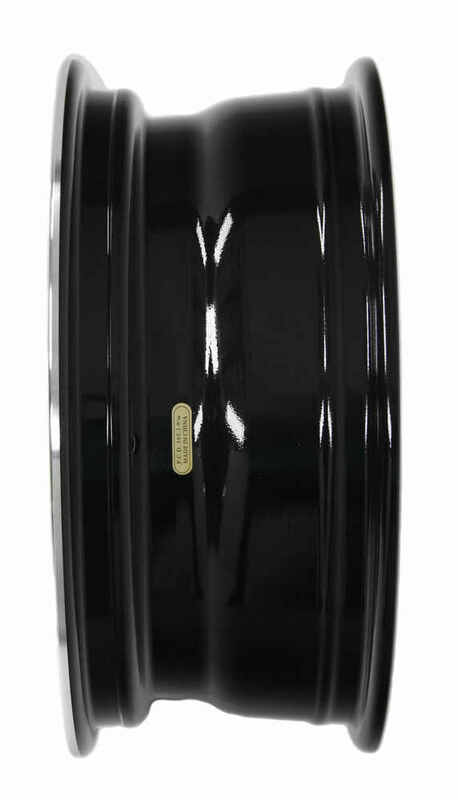 Sturdy, rustproof trailer wheel features stylish black detailing and meets Department of Transportation standards. Improved clamp force (ICF) technology ensures that it stays in place once properly mounted. Lowest Prices for the best tires and wheels from HWT. Aluminum HWT Series S5 Trailer Wheel - 16" x 6-1/2" Rim - 8 on 6-1/2 - Black part number AM22659HWTB can be ordered online at etrailer.com or call 800-298-8924 for expert service. 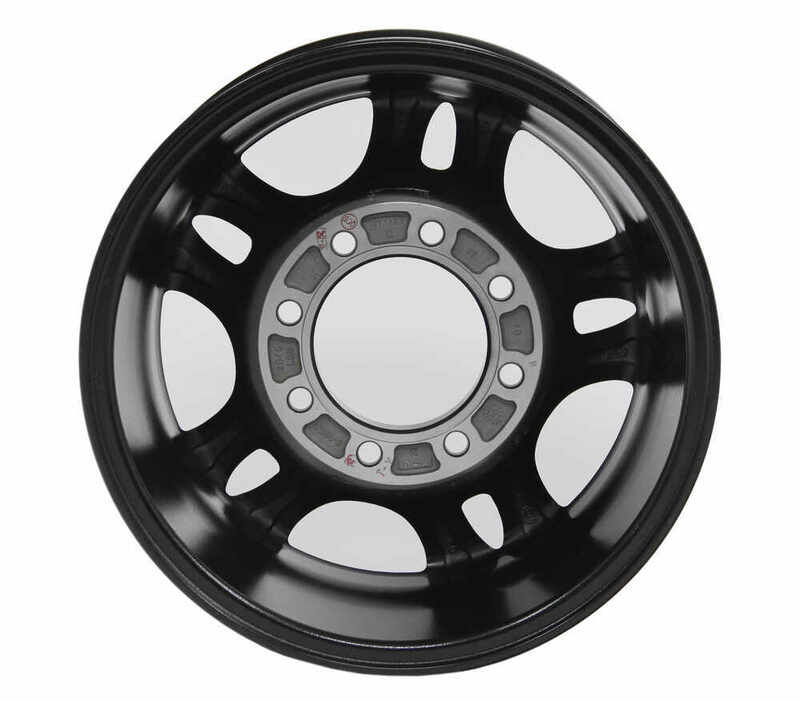 Sturdy, rustproof trailer wheel features stylish black detailing and meets Department of Transportation standards. Improved clamp force (ICF) technology ensures that it stays in place once properly mounted. 16" x 7" Trailer wheel has 8 on 6-1/2 bolt pattern and 4.88" pilot diameter. Rustproof aluminum wheel has a modular design in silver. Steel inserts in lug nut wells secure wheel. Complimentary roadside assistance included. Radial tire has 14-ply rating and 4,080-lb max load at 110 psi. 16" x 6" Aluminum wheel has 8 on 6-1/2 bolt pattern. Nitrogen fill maintains tire pressure. 1-Year No Excuses Guarantee on tire. Complimentary roadside assistance included. Today, we're going to review part number AM22659HWTB. This is the Americana Aluminum HWT Series S5 Trailer Wheel. This is a 5-spoke split-spoke design as you can see the split spoke right here. And it is a durable corrosion-resistant aluminum construction wheel. The finish on it, it has a machine polish finish on this top of the wheel and the sideslip of the wheel and then inside, it is accented in black. The whole wheel is clear coated to protect it.Now, this is an HWT design wheel. An HWT promotes a technology called ICF which is Improved Clamp Force. This will help keep your wheel securely in place. Basically what that consists of is they make the connection right here between the wheel and the hub very close. They also a special design of steel insert that are in each lug hole. The special design will allow a tire clamping load when torquing them down for less distortion. Basically there's no need to re-torque after the initial installation. This wheel is a high-quality wheel which needs DOT specifications.Now, a few specs on this, the rim dimension is a 16-inch diameter by 6 1/2-inch wide. Basically, the wheel, when you measure a diameter of a wheel, it's not the overall from lip to lip. It's from the bead seat to the bead seat. If we measure that, the diameter on this is 16 inches and same way on the width of the wheel. We don't measure the overall width. It's actually measured the inside bead seat to bead seat. Again, this would be 6 1/2 inches so it's 16 by 6 1/2.Now this does have a bolt pattern on eight on six and a half. There's eight lugs and then the six an a half measurement would be if you drew a circle between the center of all those lug holes and measure that diameter of the circle, the 6 1/2 inches. If we take this and measure directly across from center of one lug and go across to the center of the other lug, you could see it's 6 1/2 inches. This is an eight on 6 1/2-inch wheel.This does use a wheel bolt size of 1/2 inch by 20. The hub pilot diameter which is this large hole that goes over the hub on your trailer is 4.9 inches. As you can see, 4.9 inches.It does have a load rating of 3,640 pounds at 80 psi and it does have a limited 1-year warranty.That should do it for the review on part number AM22659HWTB, The Americana Aluminum HWT Series S5 Trailer Wheel. 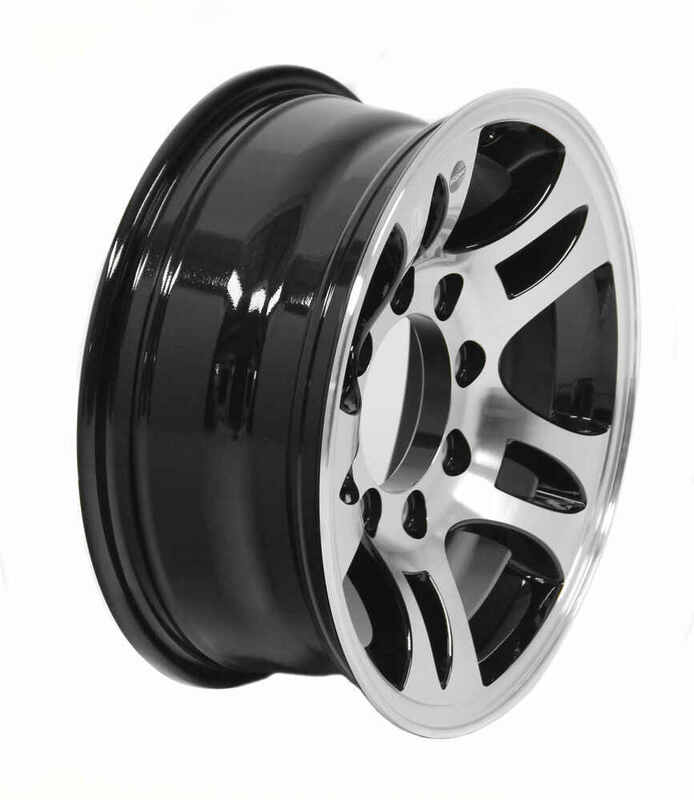 Order: RelevanceNewestRating - High to LowRating - Low to High Sturdy, rustproof trailer wheel features stylish black detailing and meets Department of Transportation standards. Improved clamp force (ICF) technology ensures that it stays in place once properly mounted. $1.63 for the chrome finish. i have no complaints after a year.would definitely buy again if need be.highly recommend. The wheels are awsome. Just what I wanted. They are on a trailer mount concrete pump. I got several compliments on them. 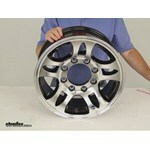 I have attached a link to our product page for the 8 inch wheels we offer that you can check out. We currently do not offer an 8 inch wheel with the split spoke feature. All of the 8 inch wheels we carry are either painted steel or galvanized steel. The Aluminum HWT Series S5 Trailer Wheel # AM22659HWTB that you purchased doesn't come with a center cap, as you found. We do, however, have center caps that you can purchase to fit the 4.9" pilot hole on your wheels. For a stainless steel option we have the Americana # AM90156C. We also have this available from Lionshead with part # LHCS109-SI60C or in black with part # 274-000004-005. 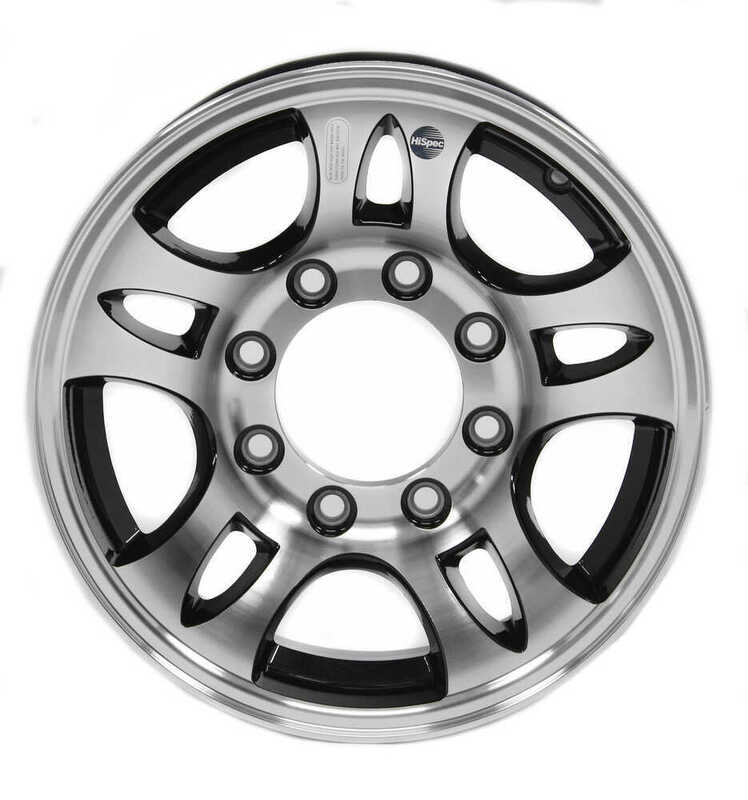 Will HWT Series Wheel Fit 2004 Montana Big Sky Fifth Wheel Trailer? The HWT Series S5 Trailer Wheel # AM22659HWTB has an 8 on 6-1/2" bolt pattern but is 16" x 6-1/2" and not 16" x 6" so you need to make sure the additional 1/2" of width won't cause any interference. If it doesn't then the wheel would be a fit for you. I've added a link to a video review of this product for you to take a look at as well. Yes, the Aluminum HWT Series S5 Trailer Wheel # AM22659HWTB does come in silver; it is part # AM22659HWT. This wheel has an 8 on 6-1/2" bolt pattern, measures 16" diameter x 6-1/2" wide and will support a tire with a load range of G so long as the tire is a fit for 16" wheels such as the Provider # TTWPRG235R16. I've added a link to a video review of this wheel for you to take a look at. Yes, they are the same wheel with just a different paint job! The Aluminum Split Spoke Trailer Wheel # AM22659HWT is all silver and the part # AM22659HWTB has black sections. Neither come with valve stems but they can be ordered with part # AM20906.